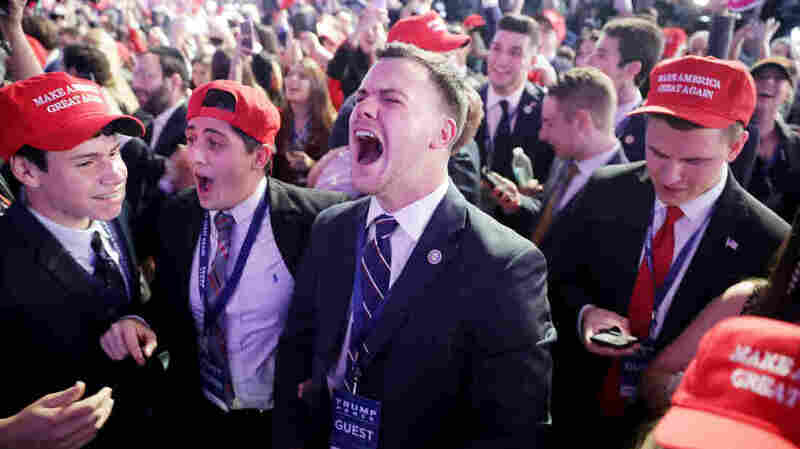 Despite So Much Winning, The Right Feels Like It's Losing Donald Trump's victory ushered in a level of conservative dominance in American politics not seen in nearly a century. But fears of losing a culture war can stoke "apocalyptic" feelings on the right. Supporters of Donald Trump celebrate on election night 2016 at the New York Hilton Midtown. Despite the Republicans' current political advantage, many conservatives still feel like they are losing their grip on the country. Diamond and Silk caused a spectacle on Capitol Hill on Thursday. "Facebook along with other social media sites have taken aggressive actions to silence conservative voices such as ourselves," the pro-Trump social media stars charged. It's a claim Facebook denies, pointing out that the social media network has changed its settings so that users see more content from friends — and less from political groups of all stripes. But beyond the fireworks before the House Judiciary Committee, the two online celebrities reflect a broader point within the conservative movement right now. Many feel unfairly persecuted by the powers that be in American culture. "I think that is a difficult thing for a lot of liberals to get, that for them you know they look and say, 'Trump's in charge, Mitch McConnell's out there, Paul Ryan — well Republicans have got everything,' " said John Hawkins, the founder of Right Wing News, a Facebook group with more than 3 million followers. President-elect Donald Trump proclaimed on election night 2016: "The forgotten men and women of our country will be forgotten no longer." With his victory, Republicans held more power than they have had in nearly a century. Conservatives had control of the House of Representatives, the Senate and the White House, and held a majority of the country's governorships. Conservatives also now have a majority on the Supreme Court, in no small part because of Trump's election. But beyond politics, Hawkins said, the average American conservative feels bombarded daily with disrespect. "He turns on a TV show where he's insulted, and then he's like, 'well, maybe I'll just unwind and watch an awards show' — the Oscars or something — where he gets trashed all day long," Hawkins said. "He goes to Twitter and he's got some you know guy calling him in a-hole ... this is sort of like a pervasive all-out attack if you're a conservative. And it's all the time sort of thing." At the core of the problem for many American conservatives is a feeling that the culture war has been irrevocably lost to their ideological opponents. "Politics is downstream from culture. And I do think that it's true that conservatives have lost in many ways the culture," said Matt Lewis, a conservative columnist for The Daily Beast who has previously worked for conservative outlets like The Daily Caller and Human Events. He also said, "There is a sense on the right that is apocalyptic and fearful." Earlier this month, Jesse Kelly, a writer for the mainstream conservative website The Federalist, wrote that Americans on the left and right can't get along anymore, that domestic unrest could be coming and that the best alternative course would be to just split the country up. "We're just not on the same page on anything anymore. Rather than the constant fighting and before it gets really nasty, I think we should just go our separate ways," Kelly told NPR. Kurt Schlichter, a columnist for the conservative Townhall.com, recently wrote a column speculating about whether there could be another civil war. He concluded there could be one and predicted how the left would lose a violent conflict if it came to it. "We want to be treated with respect, and we will not tolerate anything less which is just unacceptable for this to continue. I'm tired of Hollywood spitting on us. I am tired of academia spitting on us. I'm tired of the news media spitting on us," he said. Trump ran on these frustrations — but his election, as well as the election of many other Republicans to positions of political power, haven't dulled them. This feeling of losing the American culture war reflects polling of white, working-class Americans. A poll taken last year by the Public Religion Research Institute and The Atlantic showed 48 percent of them believe that "things have changed so much that I often feel like a stranger in my own country." "I mean, shoot, I had a conversation with my mother about this a couple of years ago," Kelly said. "This had nothing to do with the election or anything else. Like something's coming, it just feels that way and I don't like it. I don't like it at all." These feelings pop up on all sorts of political issues, from Diamond and Silk — also known as Lynette Hardaway and Rochelle Richardson — to accusations of "fake news" to the schadenfreude on the right over Kanye West's complimentary tweets about Trump this week. The 2018 midterms are coming up in just a few months. Midterms are often about exciting your base and running against the other side. Democrats are doing that by running against Donald Trump. Republicans may find that tapping into these feelings about losing power in society is the best way to motivate their base.